"Randim Stackum & Wrackem Inc - You pack it - We stack it"
If Andy's Pizza is to be used divide the layout at approx 1/3 - 2/3 with the 1/3 part being "Rest of the World" from which loads arrive and loads are sent to and the 2/3 part becomes the storage area with the pallet racking and the forklift truck. The forklift is designed to handle pallets that are approx 4.5" (110mm) by 2.5" (60mm). The tines are fixed at about 3.5" (75mm) apart. So the pallet racking bays should be about 120mm by 60mm by 50mm high say. Rolling stock consists of a small 4-wheel diesel(choose you own design) and 2 Bachman On30 flatcars (160mm by 50mm approx deck dimensions) with with stakes removed, and with steps and handbakes either removed or replaced with larger scale items. The loco is positioned between the flatcars. How it works - The Randim part - use a dice (either electronic or old style) to determine where the load on the first flatcar is to be racked. The forklift gets the load and places it in the correct numbered rack (the Wrackem part). If the assigend rack is already taken, the load is to be placed in one of the "Spare" locations(the Stackem part). Repeat for second flat car. 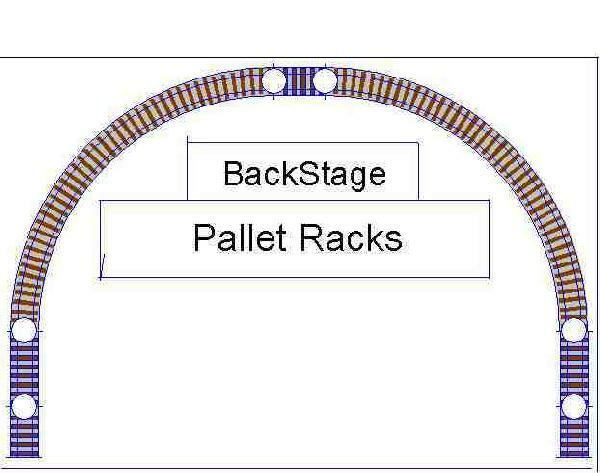 You now have 2 empty flatcars to be loaded - Roll the dice to determine the load in which rack is to be loaded on the flatcars then taken back stage for off loading. Repeat for second flatcar If an empty rack is selected then roll again - the train must leave full. 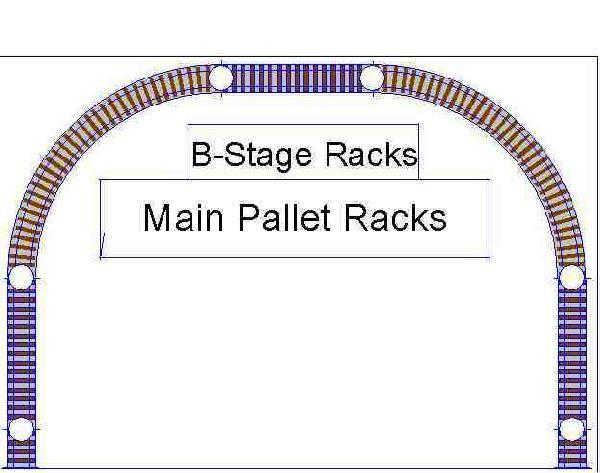 After the train leaves for the "rest of world" backstage, any loads in the spare racks are to be spotted in any of the numbered racks by the forklift. Meanwhile backstage, either manually swap the loads of the flatcars for different loads or send the same loads back out to the storage area - (Your choice). Send the train out to the storage area, and start the cycle again. 6 pallet of metal plates or tmber with layers seperated by dunnage. 7 pallets of any of the "printies" - make sure you add some weight so that the load doesn't bounce when being handled by the forklift. 8 "Dangerous" loads with suitable signage. My feeling is that you will need 6 to 10 different looking loads. 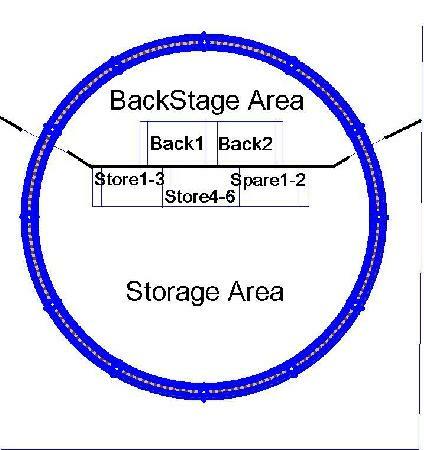 Some of the "rest of world" loads could be stored in racks attached to the back of the dividers so they are not visible from the storage area. Ok that'll do for now. Now to see whether I can draw it up Andy. Last edited by Oztrainz on Tue Mar 25, 2008 11:01 am, edited 2 times in total. Ok here's the trackplan done with 15" radius curves. Pallet rack areas are 130mm by 90mm deep with 20mm seperating each 3- high stack at the front in the Storage area. Pallet racks at the back in the BackStage Area can be 4 high as they are manually loaded and unloaded. Hi all, Here is a slightly different take with a difffent operations concept. Both plans below are designed to be operated the same way and are drawn to fit on an A2-sized foamcore base. Here is plan 2 with the pallet rack moved towards the rear and 8* radius curves. The main disadavantage with this one is that I will have to build 2 flatcars from scratch that will handle 8" radius as the planned Bachmann On30 flat cars I already have probably (almost certainly) won't handle curves this tight, but it should leave more than enough room for the forklift to operate(hopefully). The change in operations is that #1 flatcar is loaded backstage and then propelled out to the front and the left for unloading at Bay A. The loco goes to get #2 flat car that has been loaded by the forklift in the meantime at the other end of the line in Bay B. This now loaded flat from Bay B is picked up by the loco and then left behind behind the backscene for the load to be swapped manually (if desired). The loco then goes solo to Bay A to fetch the now loaded #1 flatcar. The loco drops flatcar #1 behind the backscene for the load to swapped off, picks up flatcar #2 and propels it back out to Bay B for unloading. And so on...... Three uncouplers are required - 1 on the straight track in front of each of the loading bays and another in the middle of the straight track behind the backscene. The assignment of incoming loads to storage locations and loads out from the warehouse can be generated using the dice as in the previous post. Types of loads were also covered in my ealier post. Hope it gives someone some more inspiration.